Weeks after a renegade digital ad exchange was forced to stop using a questionable new method to capture hundreds of millions of dollars worth of programmatic buys from advertisers, it’s already thinking about resuming the practice. The method, which has been dubbed “bid-caching,” was secretly developed and implemented by Index Exchange, which enabled it to capture a disproportionate share of programmatic ad buys for the past year before it was exposed recently by AdExchanger. While some have called the technique a form of ad fraud, Index Exchange is characterizing it as more of a hiatus. Index Exchange is not alone. Some digital media buyers believe the practice may have some merits and should be considered before it is completely written off. “This experience demonstrates the relationship between demand and supply isn’t perfect, and we need to think of new ways of making it better,” says Oscar Garza, executive vice president-media activation at WPP’s Essence Digital unit. To date, Garza says the industry’s practice has ostensibly been to bid only for the first impression in a user session. That's due to research and perceptions that it is the most valuable one in terms of brand effectiveness. However, Garza says there is residual value in subsequent impressions that ideally should be optimized in a truly efficient marketplace. That, in effect, is what Index Exchange says it was trying to do. The only problem is it didn’t inform anyone. The company just did it. And in the process, it won hundreds of millions of dollars worth of programmatic ad buys that some consider fraudulent, because they were not properly disclosed. A number of advertisers and media buyers contacted by RTBlog said they are seeking “makegoods” or refunds for programmatic buys processed by Index Exchange over the past year that had been employing the practice. 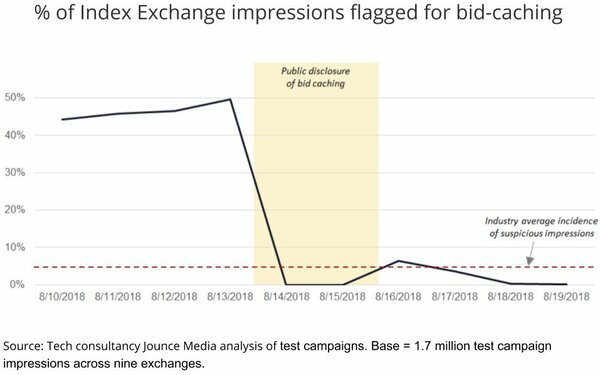 According to an independent assessment conducted by technology consultancy Jounce Media, as much as 50% of Index Exchange’s programmatic sales were flagged for bid-caching before it discontinued the practice after being exposed in mid-August. Neither the Association of National Advertisers, nor industry watchdog the Media Rating Council, had a comment or point of view on bid-caching when contacted by RTBlog. But executives at rival exchanges, speaking on the condition of anonymity, assert that what Index Exchange was doing was tantamount to fraud, because it did not disclose that it was doing something other than prevailing industry practice. They also say the practice could have a deleterious effect on the industry by 1) driving up ad prices for inventory that would not otherwise have high demand against it; and 2) by circumventing so-called “frequency” caps brands and agencies place on serving a certain number of ads to a specific user; and 3) by potentially side-stepping “brand safety” controls in place for the first piece of content in a user’s session, but not necessarily on pages they might be consuming deeper in their session. Essence Digital’s Garza acknowledged these concerns and said they are all legitimate. After a “cooling off” period, it might behoove the industry to think about ways to employ bid-caching as part of a more efficient programmatic advertising marketplace. “[Index Exchange was] trying to sell us an impression without giving us the ability to determine the difference in value. They thought that was a good thing, but we want to have control over that,” Garza explains. He add there should be a corresponding method for rendering a “second price” for bids that are cached and yield an impression deeper into a user’s session.